Investors may think Pacific Ethanol is beaten down and fumbling around, but a closer look reveals three potential catalysts for the company. The past 52 weeks haven't been very fun for Pacific Ethanol (NASDAQ:PEIX) shareholders, who have seen the stock fall nearly 60% in that period. To be fair, 2014 was a record year for ethanol producers. Low corn prices, tax credits that were more valuable than usual, and years of efficiency improvements all combined to push Pacific Ethanol profits and shares to new highs. The market has been more challenging in 2015, but there are still several positive catalysts investors can look forward to in the short and long term alike. Pacific Ethanol closed the acquisition of Aventine Renewable Energy on July 1. While it came at the price of significant upfront dilution -- the issuance of 17.7 million shares represented a 72% increase in the number of shares outstanding -- it more than doubled the company's annual ethanol production capacity from 200 million gallons to 515 million gallons. The move also bolstered annual marketing capacity to over 800 million gallons of ethanol and annual co-product capacity to 1 million metric tons, including new types of high-value co-products. The new facilities are located in the American Corn Belt, giving Pacific Ethanol a new foothold in the region. The company will both leverage existing customers and partners and develop new marketing efforts to sell and distribute the new production, which could lead to additional long-term opportunities for expansion. Co-products such as inedible corn oil and animal feeds are incredibly important to ethanol producers because they represent higher-value revenue streams that help to significantly offset ethanol production costs. Today, it's nearly impossible to compete in the highly efficient ethanol industry without developing co-product revenue streams. 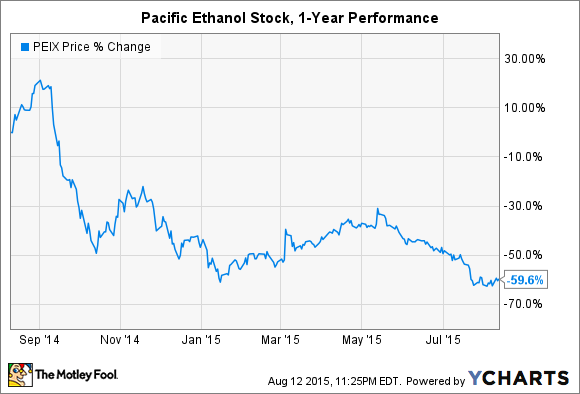 That also requires producers such as Pacific Ethanol to constantly improve their operations. The latest initiative concluded by upgrading the Columbia, Ore., facility (also called the Boardman facility) to separate corn oil from upstream processes, which gave Pacific Ethanol the ability to manufacture the valuable co-product at all of its dry mills. What's the big deal? Selling corn oil improves operating income by $0.05 per gallon of ethanol produced. That adds up over 415 million gallons of annual ethanol production from the company's seven dry mills, and significantly lowers the company's break even price. As the preceding map shows, Pacific Ethanol is headquartered in California, owns 100 million gallons of annual ethanol production in the state, and enjoys the benefit of having two marketing partners' plants nearby. That could soon prove to be more advantageous than most investors may think. California is thinking about extending and expanding its Low-Carbon Fuel Standard, which currently requires a 10% reduction in carbon intensity of transportation fuels by 2020. Amendments would extend the program to 2030 and increase carbon intensity reduction targets. The program allows Pacific Ethanol to receive a premium for the fuel it sells in California today, but an expanded program, together with a much larger company, could increase the state's value to investors. Mr. Market whacked Pacific Ethanol stock in July to account for the significantly larger number of shares outstanding after the Aventine Renewable Energy acquisition. When combined with a much weaker ethanol industry compared with the prior year, investors would be forgiven for thinking the company is faltering. But digging deeper into the financials and production gains in the quarters and years ahead points to several potential catalysts for the stock.